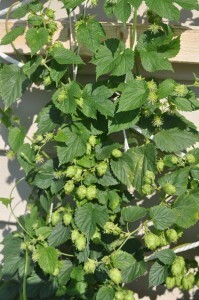 If anyone remembers earlier this grow season my hop plant nearly died on me. However, it is back with full strength. Hops are used to bitter beer. 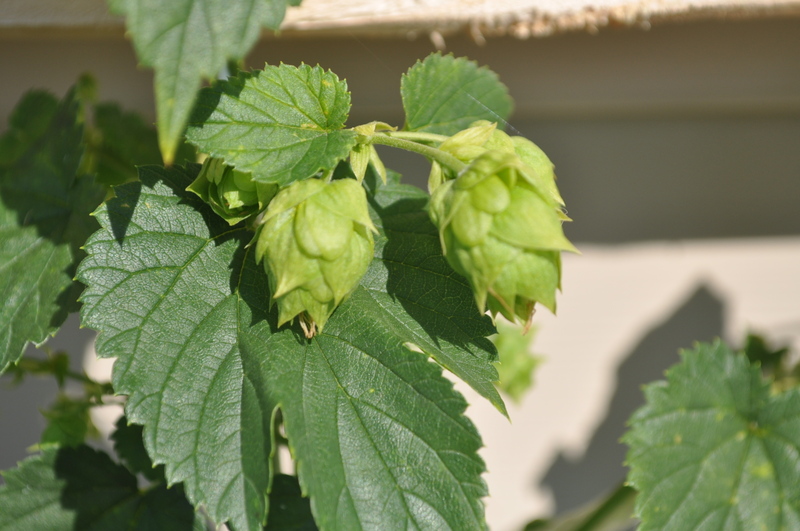 I found this link that provides information on hops and uses. It is getting about time to get the Brown Bottle Brewery up and running again. Stay tuned for pictures of the brewing process. I thinking in about two weeks I should have a batch going. Here is a picture of my plant producing buds. They should double in size before harvesting. Off to the Muff to cook for the people. Check this song out from Trampled By Turtles. Go Duluth MN! So this is the most recent picture I have of Cape Mayhem Gardens. My camera was dropped on my birthday and broke so I am using Kelly’s. I would love for this to be the reason I have been slow to post, but I have just been too busy to make a post…sorry. 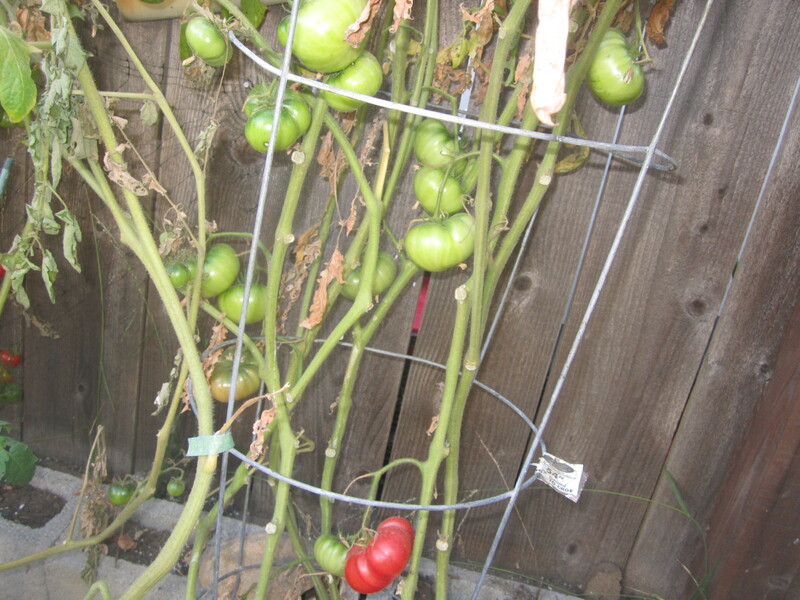 As you can tell, the tomatoes are not looking so hot. I think they will be ‘done’ soon, but I am waiting to see if any more fruit will come. 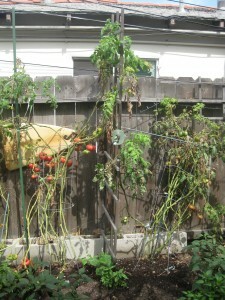 I am also debating putting in a few tomatoes that I had in pots to try to sneak in some late season tomatoes. 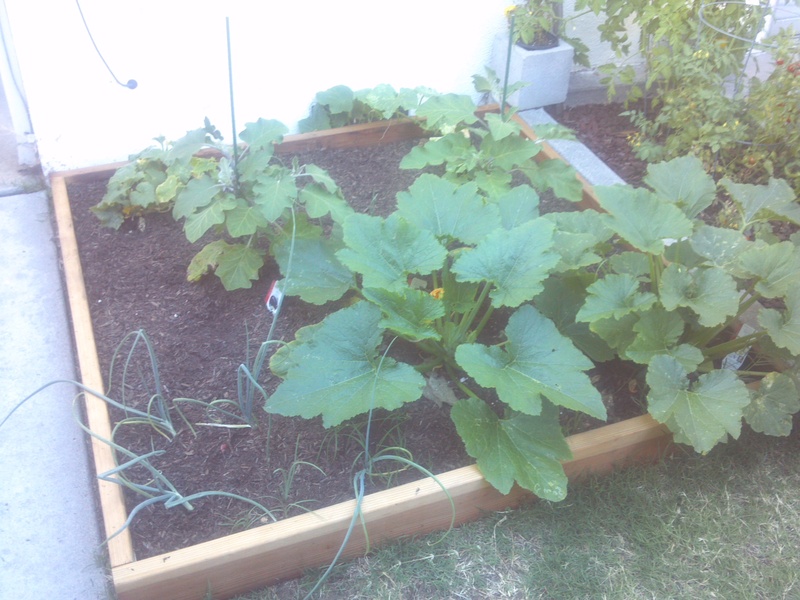 The rest of the garden is still doing pretty well though and I have been taking a gardening class at the Solana Center in San Diego. I am getting excited to give my first full time effort to grow cool season crops like Broccoli, Cauliflower, Brussel Sprouts, etc. 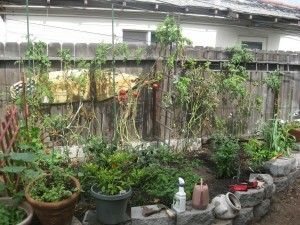 I am going to start by showing off the newer parts of the garden that are doing well. To the right are my cucumbers. 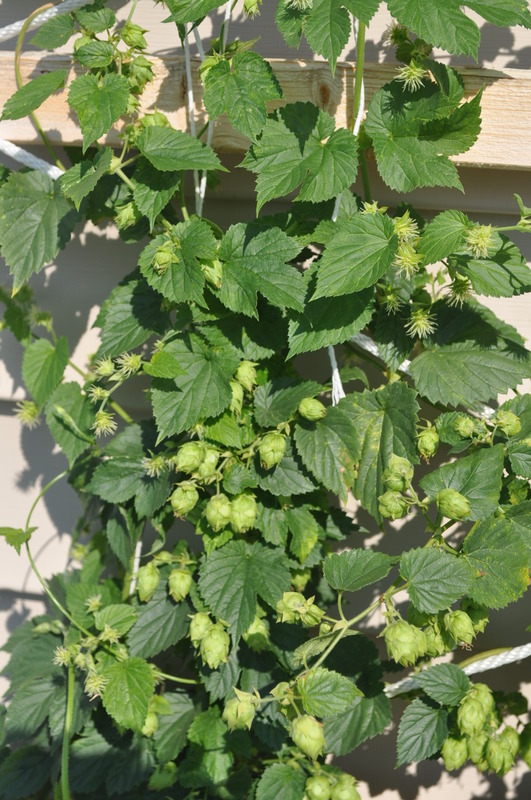 I have been trying to train them to grow in different directions in order to help airflow and reduce the chance of powdery mildew. They are doing better than the last group of plants, but I still find myself removing a few leaves every time I’m at the garden that have mildew on them. 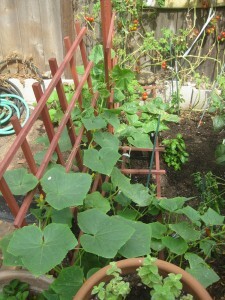 We have had some heat here in San Diego the past few weeks and the cucs have been loving it. Tons of new growth at the ends of the vines and lots of flowers. 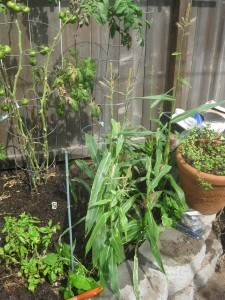 The corn below is doing well too. I can see where the ears will be and I’m hoping that they are not empty. To the left is one of my three hot pepper plants. These turn red and I like to try to get a variety of colors for my hot peppers. I have yellow, black and red. 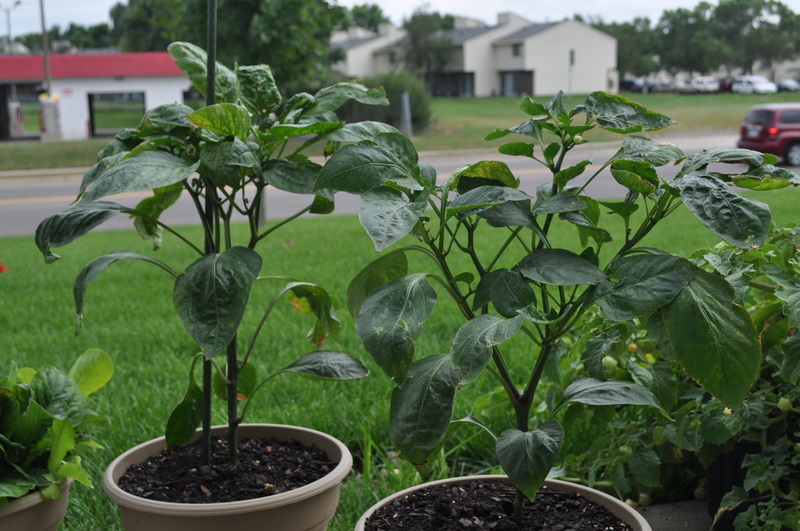 The yellow peppers are just coming along and the blacks are still flowering. 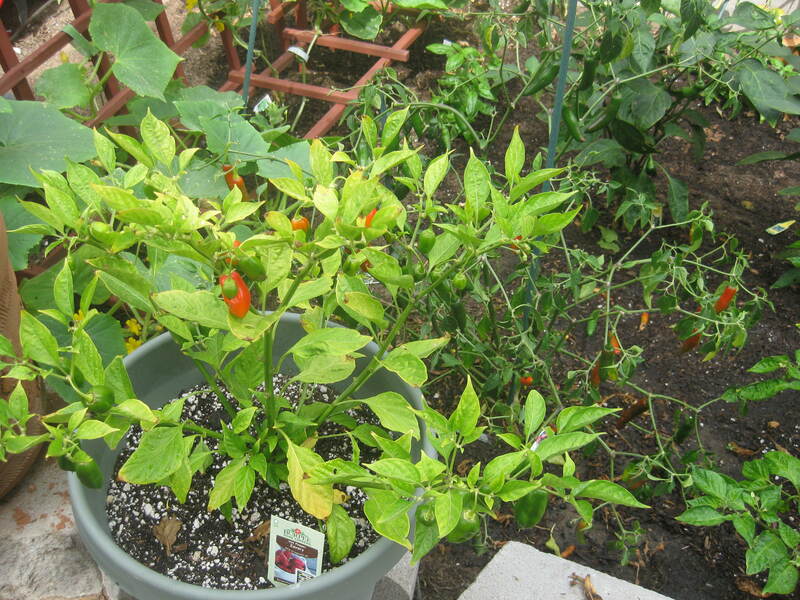 I also grow these because I noticed that uber hot peppers sell for 50 cents a piece in grocery stores. 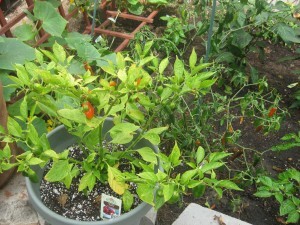 These plants produce so many peppers that I give quite a few away. 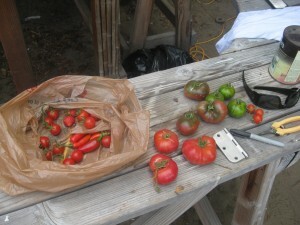 And we’re back to evaluating the tomatoes… This happens every year and I wonder if I can stop it some how? The plants are bear for the most part. 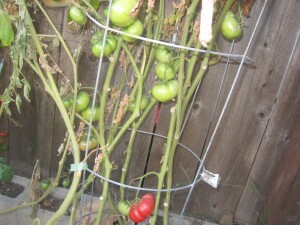 You can see tons of fruit and healthy growth on the top of the plants, but the bottom 75% are barren. 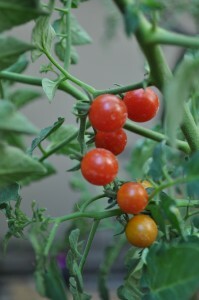 I harvested quite a bit of fruit on Sat as you will see in the next photo even though the plants look like this. I think the issue is that I didn’t cage the plants in the beginning. You can see how many vines are running up from each plant. 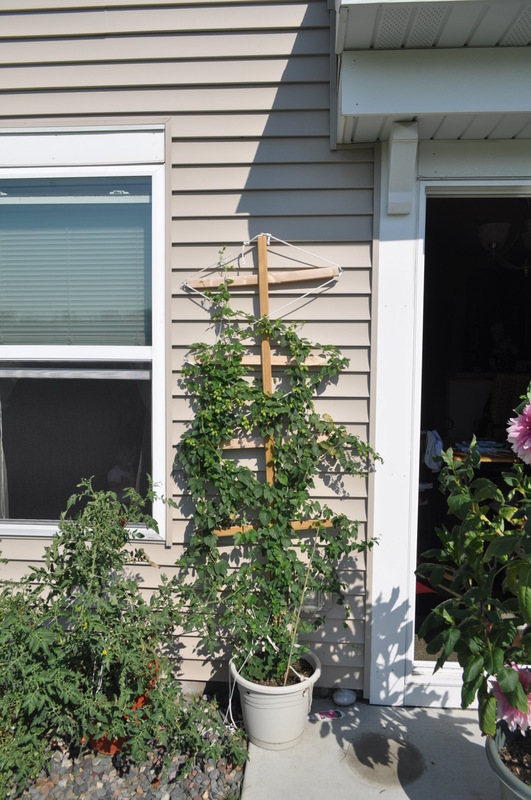 I let them get bushy, then trained them to grow tall, and now they can’t supply enough energy/nutrients to keep all the vines healthy. You can see the green zebra’s, crnkovic yugoslavian’s, and black carbon’s. They are all delicious. I can’t tell you how much better these tomatoes taste than store bought. We make bruschetta, caprese, or another version of bruschetta with goat cheese pretty much everyday now that we have the tomatoes. I put two slices of a black carbon on my sandwich for work today and it was amazing. Well, I will try to do a better job at posting more frequently. 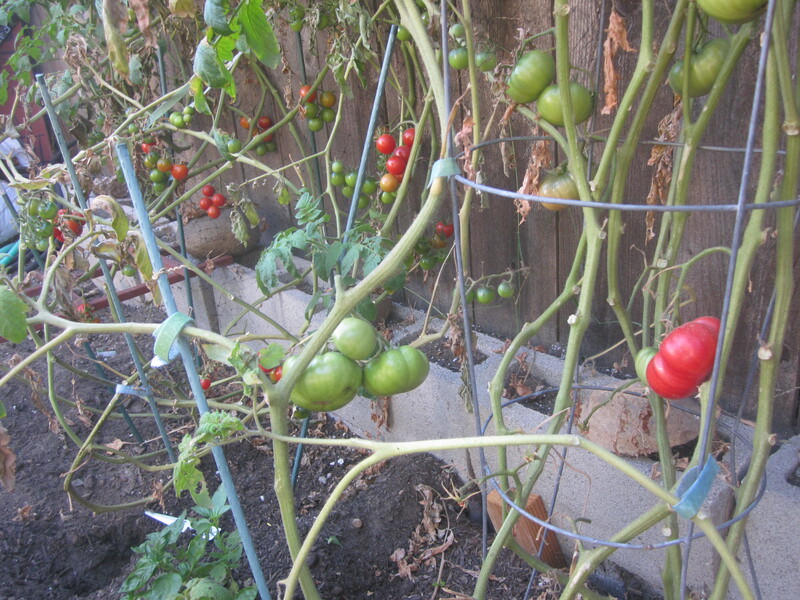 I have one more recipe for tomatoes with goat cheese and some worm updates for you. I will hopefully get a new camera soon too. 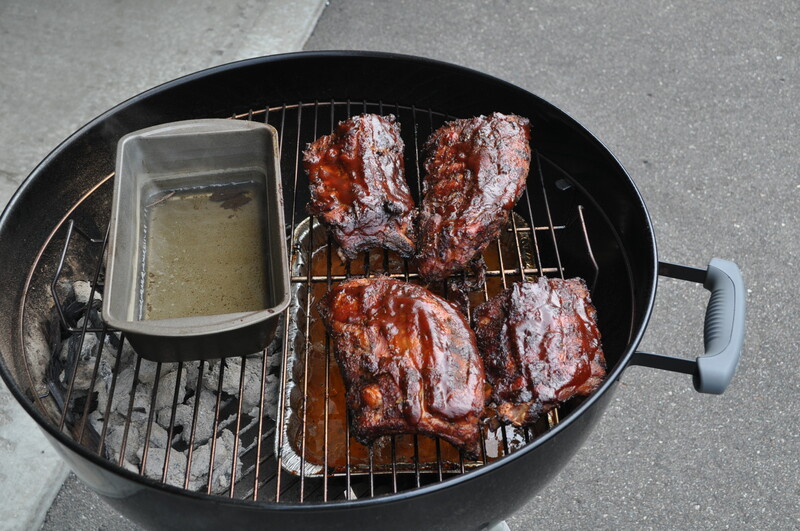 Yesterday I smoked some baby back ribs on the grill, aka Smoked BBQ ribs. I have a Weber grill that is 22.5 inches across. 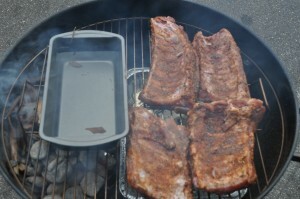 I gave my ribs a bath in a brine (find the recipe here) for about 4 hours. I add some fresh basil and rosemary from the garden. 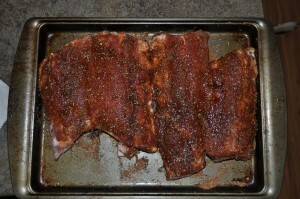 While the ribs where taking a flavorful bath I made a dry rub. 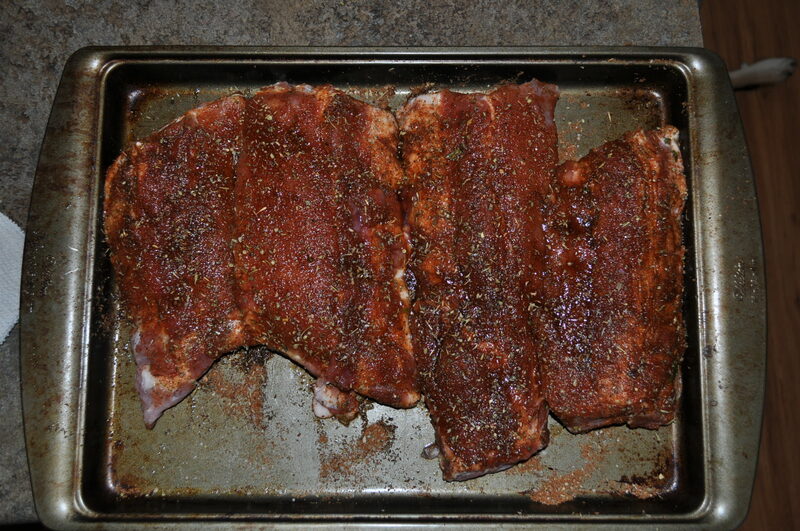 Above are the ribs out of there bath and rubbed with the dry rub. I let the ribs come to room temperature before putting them on the grill. This is a great time to start the grill. I started the chimney with about 50 charcoal bricks. On the left there are 25 more charcoal bricks. These will help keep the fire going during the long cooking process. I have two pans of water in the grill. One next to the coals and one on top of the coals. This will help keep the meat moist. I am cooking with indirect heat, by placing the ribs away from the coals. 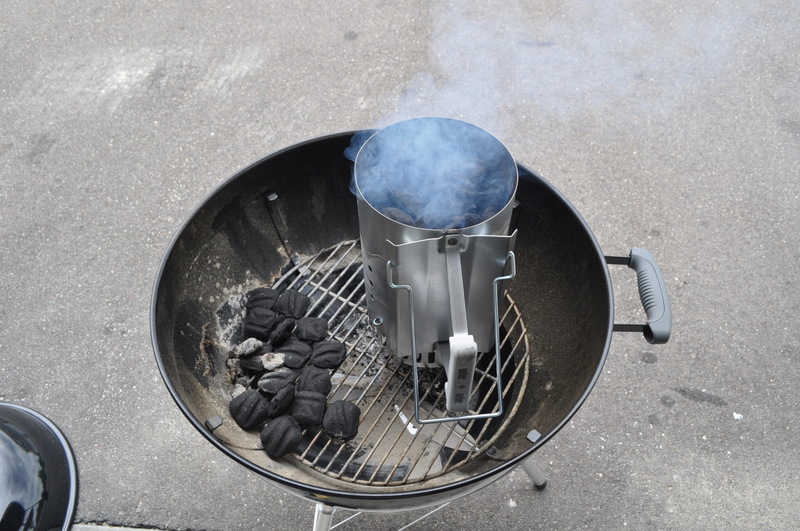 I added some wood chips for smoke and closed the lid. I checked them and rotated the ribs every 45 minutes . About three hours later they were done. I add some bbq sauce and let them sit on the grill for about ten more minutes. Serve with your favorite garden vegetables. Enjoy!! I use this dry rub for my smoked BBQ ribs. You can use this dry rub for chicken as well. I make a recipe and save it in an air tight container for later use. Add fresh herbs from the garden to make it your own. So many great empires hath come and gone. It is quite fitting that immediately after posting about the spread of my zucchinis, they have met their maker. At the zenith of their power, like Rome before them, a barbarian horde in the guise of a white, filthy powder has been their undoing. Powdery mildew has arrived in my garden. The white ghost crept in during the night, and the natural defenses of my plot were not up to the task of repelling the inital attack. I’ll get a couple pictures of the devastated plants up in my next garden update. 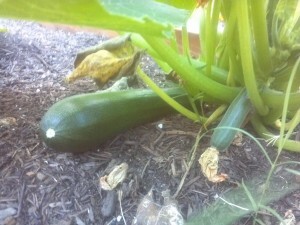 The powdery mildew hit the zucchinis first. But it has since spread over to and devastated my cucumbers as well. 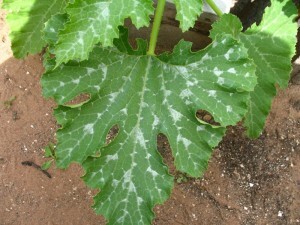 Apparently powdery mildew is the bane of any zucchini farmer’s efforts for a healthy crop in Southern California. Powdery mildew is a fungal disease that affects plants belonging to the Cucurbita pepo family; vegetables like zucchini/squashes, cucumbers, peas, melons, etc. A very good, detailed article on the topic may be found here. This wikipedia article on powdery mildew is also good but over the top. Powdery mildew is very prevelant in Southern California gardens. It occurs most frequently in late Summer, just in time to ruin your harvest, when things are getting really hot. That’s what happened here in the past couple weeks finally. Each day has been hotter than the one before, with temperatures hovering in the 90s. This heat wave has really allowed the mildew to spread quickly. I first spotted the signature dried out white lines a couple weeks ago. I should have immediately pulled up my zucchinis, or at least cropped the leaves, to keep the powdery mildew from spreading. Alas, perhaps I waited too long and now the leaves of both my zucchinis and both my cucumbers have wilted, yellowed, curled, browned and now fallen off. I don’t know if it has affected the taste of the cucumbers, but I also harvested my first cucumber last week, and it was very bitter, almost tasted soapy. All is not lost however. 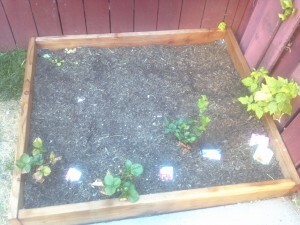 I have been trying to combat the powdery mildew with a home made solution. I mixed one table spoon of baking soda, a half teaspoon of dish soap, and one gallon of water. Then I put it in a conventional sprayer that I got on Amazon. A couple hand pumps, and I get the leaves with a quick coating of this mixture. It sounds pretty nasty, to be eating soap. But think about it, you wash your plates with dish soap. This is about the safest natural fungicide one is going to find. Other options include neem oil, chamomile tea, and skim milk. I have not tried these options but would love to see anyone’s thoughts in the comments. The key is to not overspray the leaves because that will cause run off of the solution. 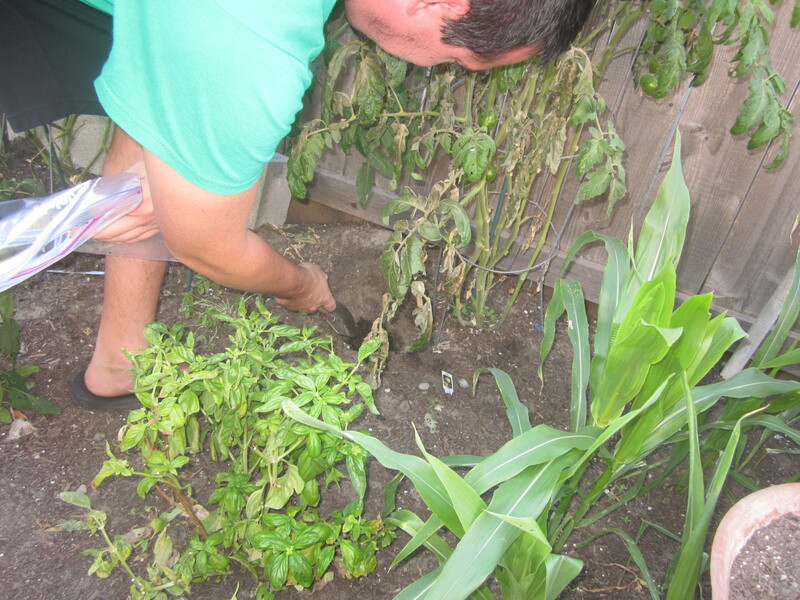 If too much of the solution runs off the leaves and into the base of the plants and seeps into the soil, it will start killing off the beneficial bacteria in the soil, compounding problems. So take care to only lightly coat the leaves with the spray if you are faced with this same problem. 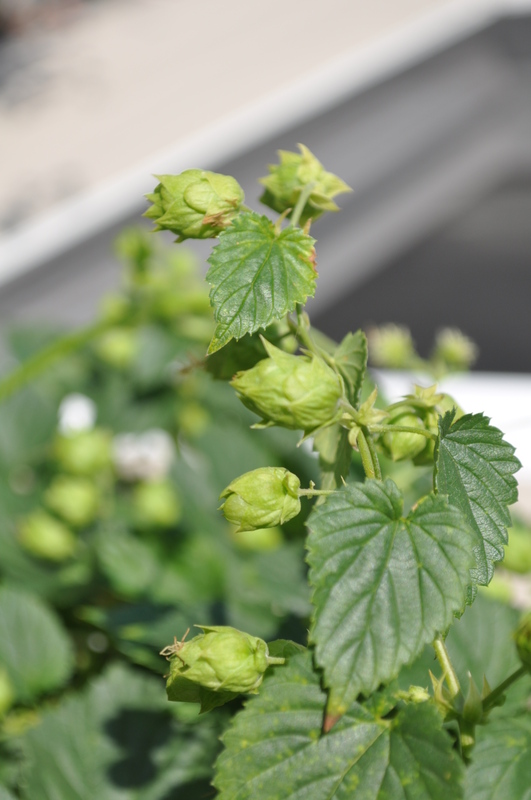 Also, it is important to realize that the spray will not just wipe out the powdery mildew but also beneficial bacteria from the leaves themselves. Assuming you successfully combat the stuff, you should get some helpful bacteria and lightly dust the leaves. 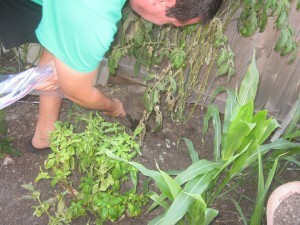 Paul’s worm castings or compost would be perfect for this purpose. I am starting to see positive results already. I finally got rid of some of the deadest leaves, and have reclaimed some territory from the powdery mildew on the leaves that were not too far gone over to the white side. It is really good to see this working and to harbor hopes of getting a few more zucchinis and cucumbers this summer. 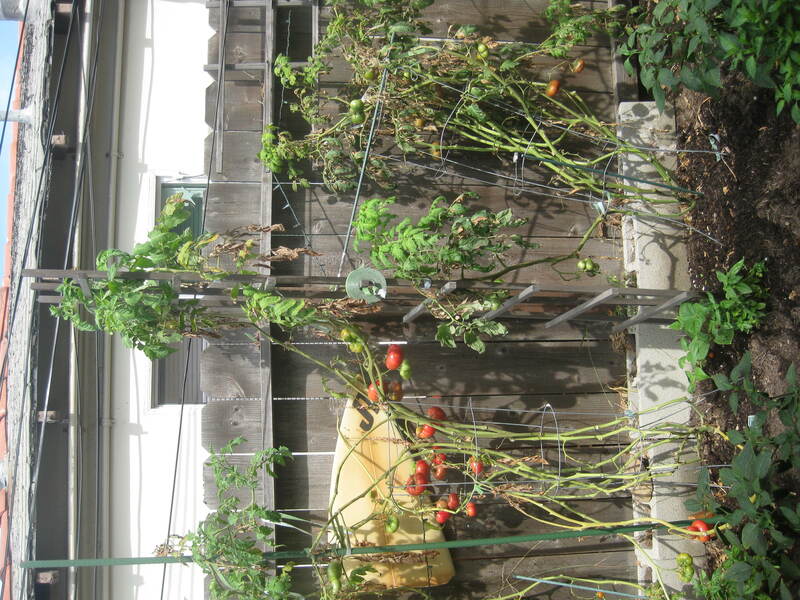 I will continue to update everyone on the great Powdery Mildew war of August 2012, and the zucchinis battle for garden supremcy. Wish me luck. As stated before I am a Chef at Muffuletta In The Park. 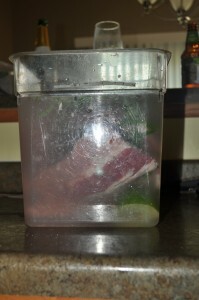 At the restaurant we use a brine for all our pork and chicken. 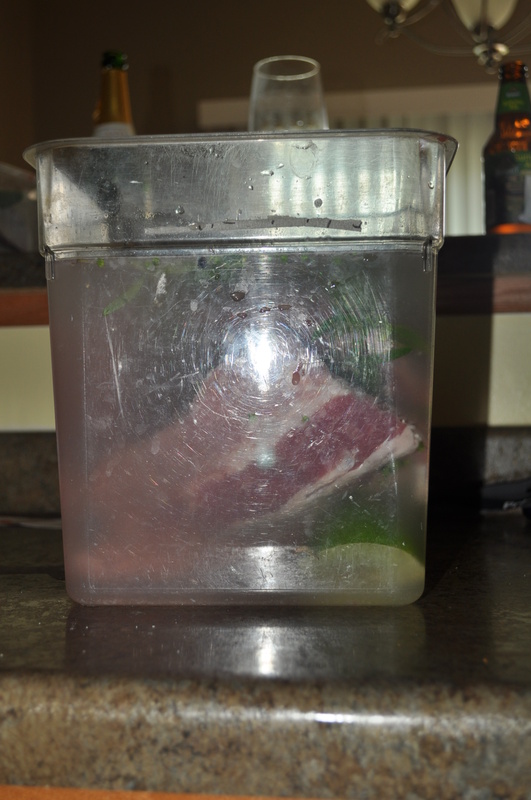 We do this to add flavor and moisture to the meat. 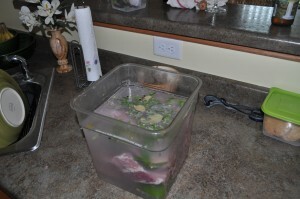 The fun of a brine is that you can add any herbs or spices you want from the garden. This recipe is a good starting point. I recommend that you keep the meat in the brine for a minimum of 4 hours. We do 24 hours at the restaurant. Enjoy!! Cooking brings family and friends together. 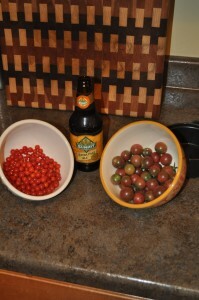 This post is all about tomatoes and jalapenos!! On the left is pea currant tomatoes. They are super small and packed with sugar. Megan made a pasta salad with them today for lunch. On the right are my cherry tomatoes. Unfortunately, I can not remember what type they are. I am going to turn then into a Cous Cous salad. Recipes to come! 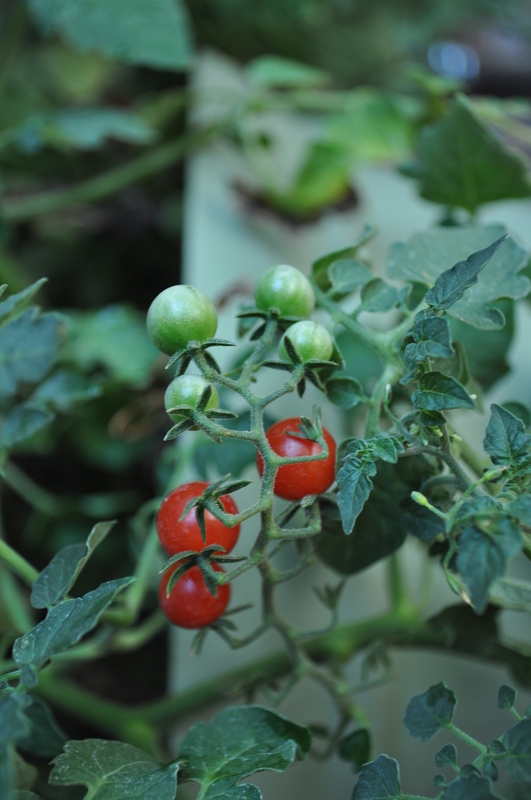 Here is a couple of close up pictures of the pea currant tomatoes on the vine. 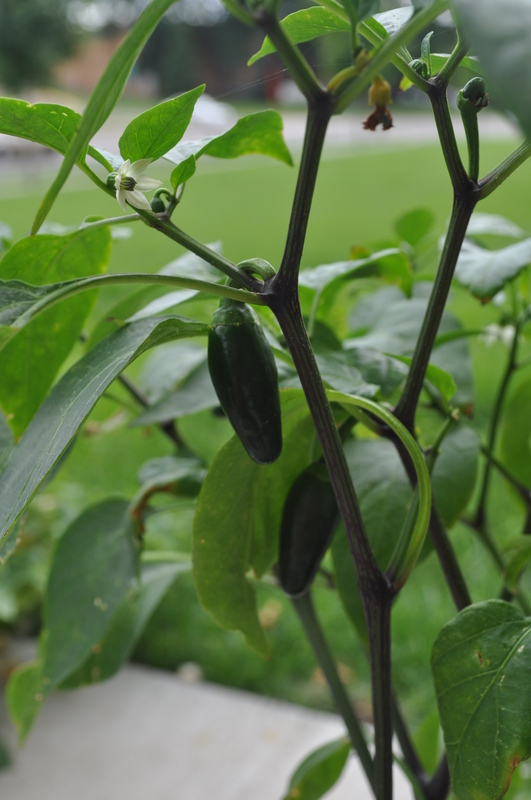 My jalapenos are finally starting to show some fruit. They are pretty small yet, but with the last couple of sunny days they really took off. I bought a Weber charcoal grill today from Fleet Farm and smoked a whole chicken!! Pictures to come. 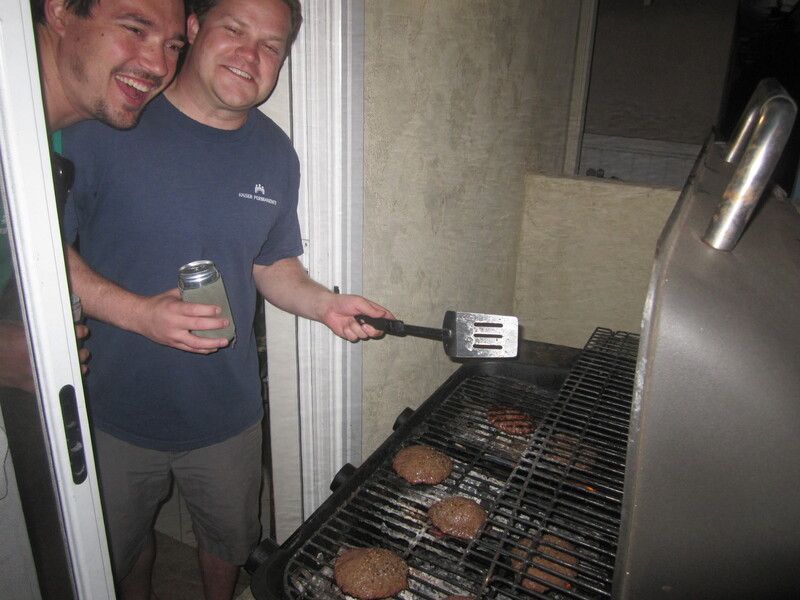 Find recipes from agridudes on this blog!!! Sorry for the uber late post…This was from 2 Sundays ago after I did all that worm work. It was my birthday last Friday and the celebration started on Thursday which didn’t leave a lot of time to post. 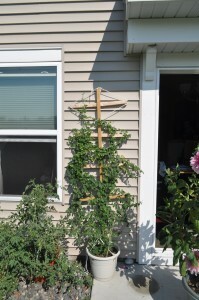 I ended up going to the nursery for a few supplies and ended up buying a 6 pack of pole beans and an edamame plant, a bunch of lady bugs, and 2 giant stakes to tie the tomato plants to. 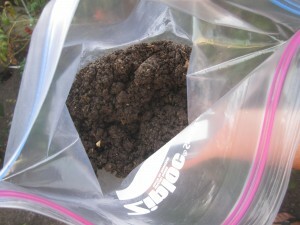 The picture on the left is the vermicompost that I harvested from my Worm Factory 360. 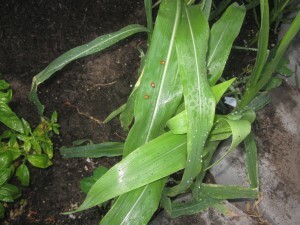 I bought the lady bugs to eat the catepillars that were eating the tomato leaves and fruit. After learning that legumes put nitrogen back into the soil, I decided to buy some bean plants to help put some nutrients back in the ground. 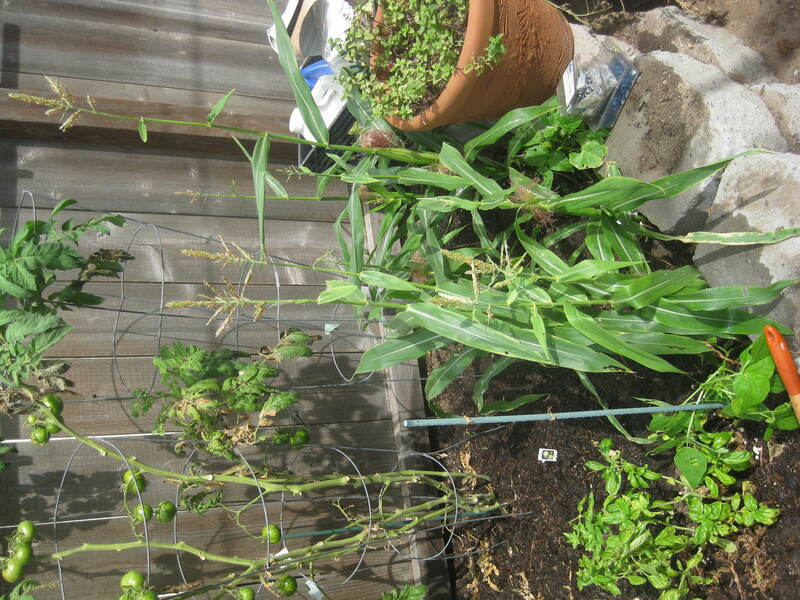 I also want to experiment with the Native American method of the 3 sisters garden, except I’ll only be using corn and beans. The directions from the Worm Factory 360 say to dig holes near your plants and then fill them in with the vermicompost that was harvested. 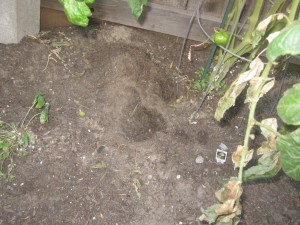 To the right, you will see a hole next to my green zebra tomato plant. By placing the vermicompost in the whole, when I water moving forward, the water should pass through the compost and bring the nutrients down to the roots. 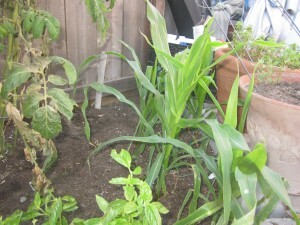 To the right is my corn growing. I think it is doing pretty good for the late planting it received. 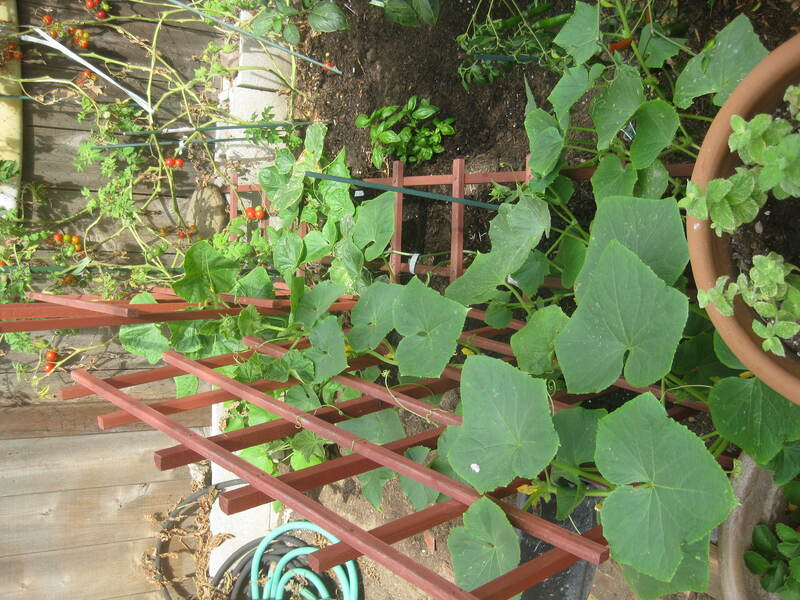 The three sisters garden is a Native American technique of growing corn, beans, and squash or pumpkins together. 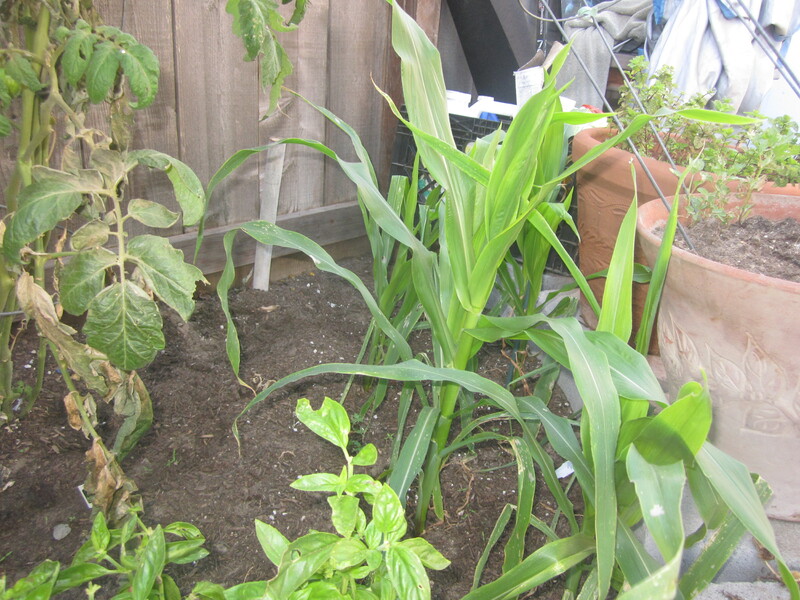 The corn acts as a pole for the beans to climb, the beans put nitrogen in the soil for the corn to grow, and the squash provides ground cover to retain moisture. You can’t see the beans in this picture, sorry, I’ll get a better picture next time. In the picture on the left, you can see some lady bugs crawling on the leaves. 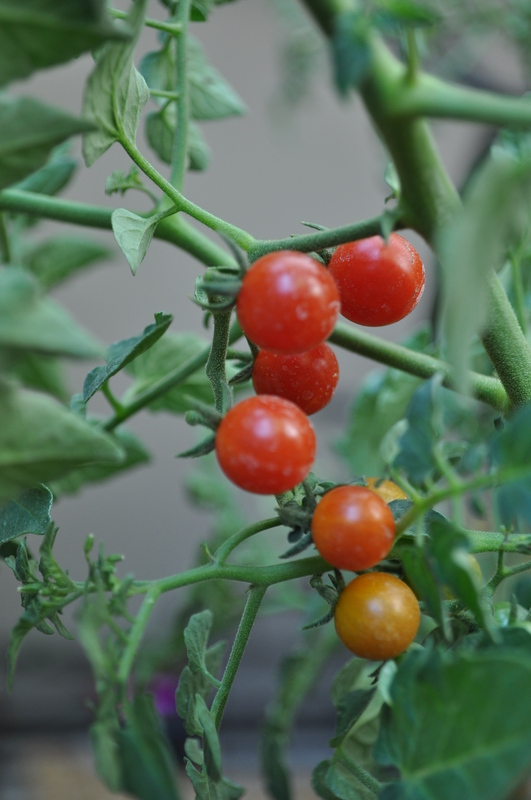 I noticed some holes in our tomatoes and on leaves on many different plants. We have had this in the past and we used to look for the caterpillars by hand, but I learned last year that lady bugs will eat them. I bought a pint size container of them from my nursery and dumped them on plant leaves in the evening. They will stick around the garden as long as there are bugs for them to eat. I saw some on Saturday so I was happy that they are still hanging out. These photos were all taken back on July 19, when I did my second real harvest. am still playing catchup with my posts, and unfortunately my garden isn’t looking as pretty today as it was a couple weeks ago when I took the below pictures. T he real story here is my zucchinis. Check out how these guys totally took over the expanded patch. They came, saw and conquered the already growing eggplants and onions. I hope the onions still turn out. 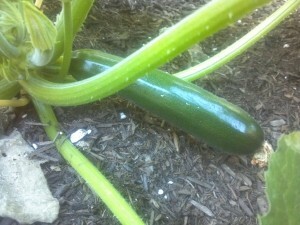 But the huge submarines we’ve been pulling off zucchini plant have made it worth it. I really wanted to try this squash blossom recipe too, but all the flowers started flowering before I got around to picking them. 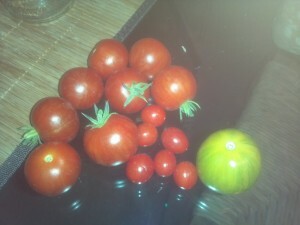 The tomatoes were still doing pretty well and producing at this point. Here’s the second haul that we got that day. We got these just in time in time to take up to Big Bear. 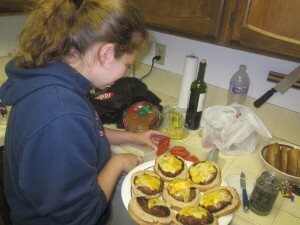 The awesome bruchetta we made is shown in the pictures in the Big Bear post, and the recipe will be available soon too. Last and most certainly least is my struggling fruit/lettuce plot back by the fence. You can see the little lettuces trying to come up in the background, bless their hearts. Keep fighting the good fight guys. Poppa needs his greens. All the berries in the front are pretty much on their last legs. I have to do some reading to figure out what went wrong here. I know Paul suggested that I need another blueberry plant because you have to have two to get them to cross-polinate. But I don’t know what happened to the strawberries. 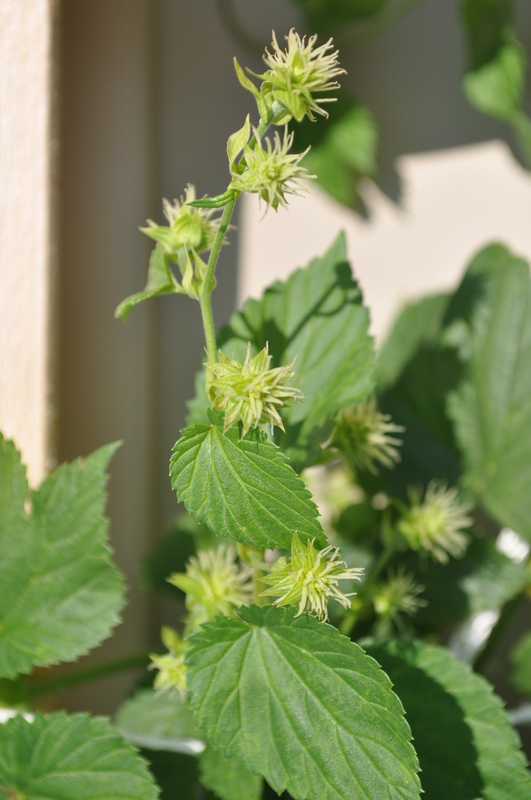 I am just hoping the raspberries over on the right hold on and by next year grow into an actual producing plant. Wish me luck. 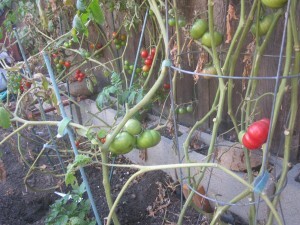 Stay tuned for my next updates with an awesome bruchetta recipe and finally the building of my trellis.